Strange “Psychoanalysis” comics from the 1950s ~ Free Online! “Psychoanalysis was a short-lived comic book published by Entertaining Comics (EC) in 1955, the fifth title in its New Direction line. The bi-monthly comic was published by William Gaines and edited by Al Feldstein. 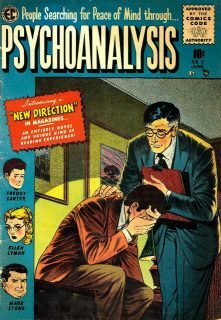 Psychoanalysis was approved by the Comics Code Authority, but newsstands were reluctant to display it. It lasted a total of four issues before being canceled along with EC’s other New Direction comics.